Shared Space was pioneered by the late Dutch traffic engineer and PPS friend Hans Monderman. Monderman spent the early part of his career as a “traditional” traffic engineer. As his experience grew, he became concerned that many of the engineering “improvements” that government was making in the interest of safety actually made some road segments more dangerous. He observed that this was particularly true in urbanized areas, from villages to cities. These were the areas that brought high volumes of pedestrians and bicyclists into conflict with cars and trucks. In urban areas, the allocation of space is heavily regulated by signing, traffic lights, crosswalks, sidewalks, etc., all of which create the sense for each user that the space is their own and they can behave as they choose therein. Responsibility for one’s own behavior was eroded; users simply had to stay within the limits prescribed by speed limits, white stripes, and red or green lights. Monderman developed a simple, if counterintuitive solution. If he removed the traditional cacophony of signing, striping, and traffic lights, people would stop looking at signs and start looking at each other. Particularly with respect to drivers, this returned them to the mindset of a fellow citizen, inducing them to regain the manners that they possess when crossing paths with a fellow pedestrian while passing through a corridor at home or at work. One nods to the other, “go ahead;” they smile at each other and move on their respective ways. On our roads, motorists have been groomed to feel as if they have absolute priority and there is no need to respect the passage of pedestrians or cyclists, at least until the traffic light turns red. Ben Hamilton-Baillie, originally trained as an architect, developed an interest in improving the quality of streets and public spaces, and in finding new ways to promote safety, economic vitality and civility. This led him to Hans Monderman's Shared Space, and Joost Vahl's Woonerfs. Much of the work of Hamilton-Baillie Associates is based on the lessons learned from those two, as well as extensive research and observations of best practices in mainland Europe, North America, and across the UK. Ben’s work incorporates the lesson of Vahl and Monderman and helped develop the idea that to make a street safe you have to make the users perceive the actual danger they face. The over regulation of streets create a false sense of security, causing motorists, pedestrians, and cyclists to stop looking out for each other and proceed without caution. Like Monderman and Vahl, Ben feels that the best way to manage traffic is through integrated urban design and street planning; you don’t need to over regulate. All three concluded that the worst places are where it is not clear as to whether it is a public space or a highway; when urban and street designers allow elements of a highway to leach into town, you will get a poor highway AND a poor public realm. Two of Ben’s more noteworthy projects are Poyton Village and Exhibition Road. In Poyton the street scheme involves the regeneration of the main shopping street, Park Lane, and the reinstatement of Fountain Place, the historic centre of the village. 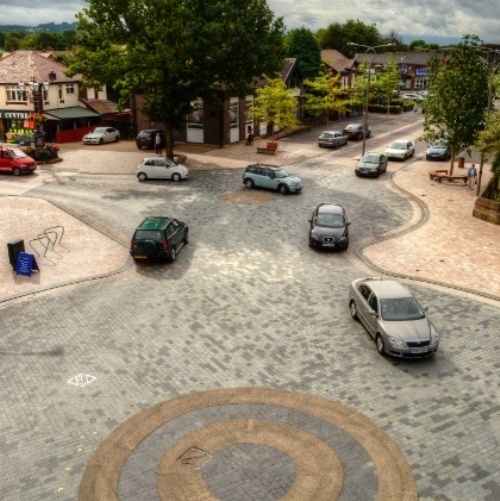 The street has been redesigned with an informal central median strip, with courtesy crossings and extended pedestrian areas, unified through a common paving pattern. Traffic lights have been removed. This busy intersection at the heart of the town was formerly a hostile and congested traffic space, dominated by traffic signals and road markings. 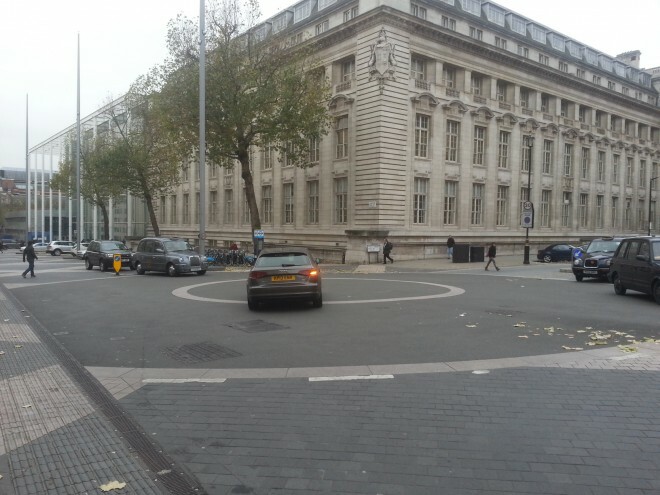 These have all been replaced with an informal junction involving two inter-connected roundels. The project was finished early in 2012. Fundamental to Ben’s thinking on Exhibition Road is the idea that pedestrians are Pythagorean; in other words, they want to cross streets on angles. 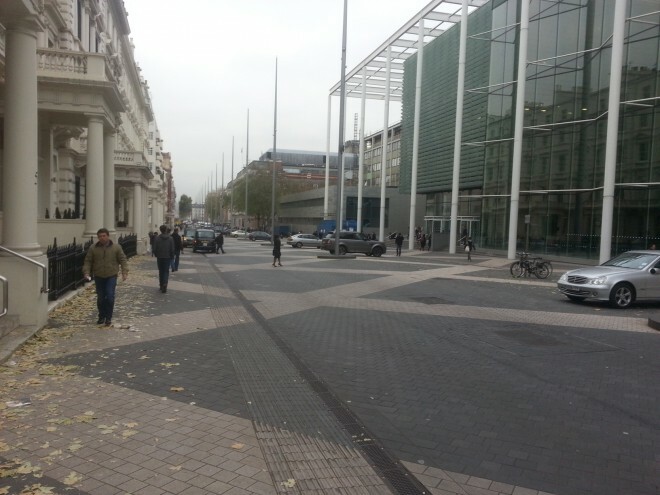 The “criss cross” lines on Exhibition Road celebrate the diagonal tendencies of pedestrians. One of the intersections includes painted circles which are intended to send subconscious suggestions to drivers.